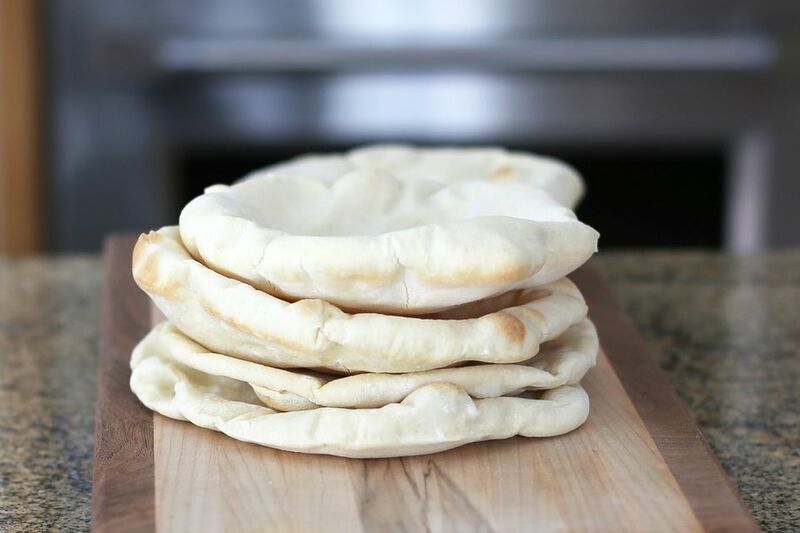 If you think making your own pita bread is a difficult task that takes years to master, think again. This pita bread recipe is easy to make and requires few ingredients. You'll be rewarded with delicious, puffy pockets—the signature characteristic of this Middle Eastern and Mediterranean bread. Pita bread makes wonderful sandwiches, simple to stuff with your favorite fillings. It is also ideal for scooping up rice and sauce when served with a variety of dishes. Pour yeast into 1/4 cup of the warm water; add the sugar and let stand for 10 minutes. Sift 2 1/2 cups of the flour with the salt into a bowl. Form a well in the center; pour in yeast mixture and remaining 1 cup warm water and 1 tablespoon of olive oil. Begin to mix with your hand, wooden spoon, or dough hook of a standing mixer, adding remaining flour as needed. Turn out onto a floured surface and knead for about 10 to 15 minutes (or use the machine and dough hook), until the dough is smooth and soft but not sticky. Oil a large bowl; place dough in the bowl and turn to coat the entire surface with oil. Cover with a damp cloth and put the dough in a warm, draft-free place for 1 to 1 1/2 hours, or until doubled in size. Preheat oven to 475 F. Place a heavy baking sheet or baking stone on the lowest rack of the oven. Roll the dough out, then fold and roll again. Do this a few times to get the air bubbles out of the dough. Divide into balls about 2 1/2 ounces each (approximately 5 tablespoons of dough) and cover with a dampened towel. Roll each ball into a circle on a lightly floured surface with a floured rolling pin, rolling and turning the dough as you would a pie crust. The circles should be about 1/4-inch thick and about 7 inches in diameter. Sandwich each dough circle between floured cloths and let them rest while you roll the remaining dough balls. Sprinkle the hot baking sheet or baking stone lightly with flour. Place a few of the circles on the stone or baking sheet (or as many as will fit comfortably). Bake for about 5 minutes, or until they just begin to show some color, carefully flipping them half-way through. Remove from the oven and cover with a clean kitchen towel until cooled. Place in food storage bags until ready to use. The Ultimate Snack: Homemade Soft Pretzels!